With today’s release of the Android SDK for Windows Azure Mobile Services, I thought it would be a good idea to post a walkthrough of adding some features into the quick start application. 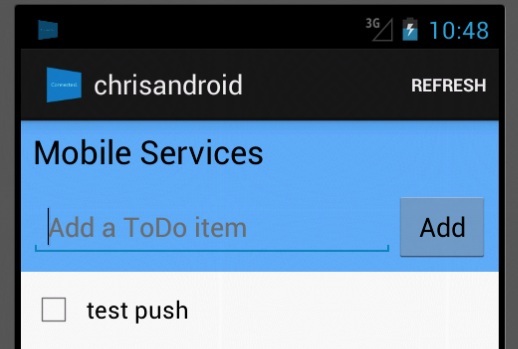 The quick start, which you can download after spinning up a new Mobile Service, is a ToDo list. It’s a rather simple application which already makes use of the structured data storage capabilities of Mobile Services to save, update, and read todo items. In this post, we’ll look at how to push a notification out to each user whenever a todo item is added. On it’s own, this may not be very desirable behavior in an application (unless everyone else running it will do my todos for me), but you can combine the concepts from this post with others (like authentication) to push to a specific user if you want to. There are a number of steps we need to take once we have the todo list quick start application, but let’s start with that. Since I’ve covered this aspect of getting started with Mobile Services on several occasions (and it’s very straight forward) I’m going to glaze over some of the details. If you don’t already have a Windows Azure account, you can sign up for one for free here. Once you’ve done that, you’ll have access to create 10 free Mobile Services. Next, you can watch this video to step through how to create your first Mobile Service and download the Android quick start application. If you don’t feel like watching the video, I’ll summarize the steps you need to take after logging into the portal. Start by clicking the + NEW button in the bottom left. Select COMPUTE then MOBILE SERVICE and click CREATE. Enter a unique name for your Mobile Service (this is how your Mobile Service will be labeled in the portal and part of the URL that will point at your service), choose if you want to create a new or use an existing database (if you have any) and pick a REGION (data center) before proceeding. On the next screen, either choose to create a new server and enter admin credentials for it or pick an existing server / database and enter the creds for it. Click the check mark and your Mobile Service will start being created. After a little bit (it usually takes about twenty to thirty seconds) you can click on your Mobile Service and you’ll first be taken to the quick start page. Here, under CHOOSE PLATFORM select ANDROID and then follow the guide under Create a new Android app. Note that the first step isn’t necessary if you already have an IDE (we’ll assume Eclipse) with the Android SDK (at least 4.2) and ADT installed. Once you’ve created the TodoItem Table you can download your project. Next in Eclipse, go to Import under the File menu and choose Existing Projects into Workspace. Navigate to your project and select it and it should be imported into Eclipse and show up in the Package Explorer. If you want to, you can run the project now to see what the Todo list app looks like, but we’ll proceed on with adding authentication. After that, go ahead and click the save button. 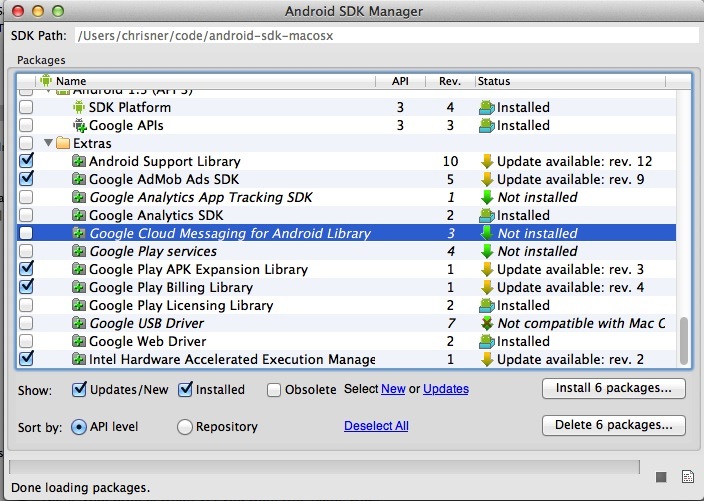 Next, browse to the SDK path (in the image above it’s /Users/chrisner/code/android-sdk/macosx) and then go to the /extras/google/gcm/gcm-client/dist folder. Copy the gcm.jar from this folder into the libs folder of your project. This is the library that will enable you to hook into Google Cloud Messaging from your Android application. Again, make sure you replace the com.example.chrisandroid with whatever your package is. Now let’s work on getting the registration ID. This code will essentially start the registration process if you haven’t already registered. Now we need to add a class to handle both getting the registration message back and receiving messages from the GCM server. Here we’re creating a MobileServiceClient again. If I were building a real app, I would probably abstract my MobileServiceClient away so that I only create one instance of it and don’t have to repeat the URL or key (make sure you replace those with your own values before using this code by the way). However, since we’re trying to keep this brief, I’ve recreated it here. Next we get a MobileServiceTable for our Registration class and create a new instance of Registration and set it’s registration ID to the value returned from the GCM server. Last, we insert that into our table and log whether it was successful or not. We’re almost ready to run our app. This script handles inserting the todo item and then doing a push using GCM. It does this by reading the Registration table and sending a push through the push module’s gcm method to each Registration ID in the table. Now you can run your app. Congratulations. With that you’ve received your first push notification from GCM using Mobile Services. Today we walked through the steps necessary to add push notifications to your applications using Google Cloud Messaging and Windows Azure Mobile Services. There were a few methods we didn’t implement in the intent service including onError and onUnregistered. In a real application you would want to do something in these method so you would understand what was going on. For example, if you receive a message to onRegistered, you should let your server know to no longer send push notifications to that registration Id. Additionally, in ToDoActivity.java we were checking to see if GCMRegistrar.getRegistrationid(…) was set or not. If it is, you may want to check to see if you have already saved it to the server and if not, save it. Lastly, you’ll probably also want some way of making sure you don’t insert the same registration ID multiple times on the server (by deduping in the insert script for the Registration table). There are many improvements you could make over this sample but it should get you started with pushing information to your Android applications. You can access the completed source code for this application here. Remember that you’ll need to set your URL and app key in both the ToDoActivity and GCMIntentService classes in addition to getting things set up on the server (create the tables and set the insert script for TodoItem). Good luck with Mobile Services and let me know if you build anything with it. Thanks Chris, if I want to work with mobile services in android I aways end up here. If a user uninstalls my app can I catch that an unregister?, or how would be best to handle this. Thanks for the great blog. Chris, I've downloaded your sample project and set my project url and key inside MobileServiceClient class and my SENDER_ID. 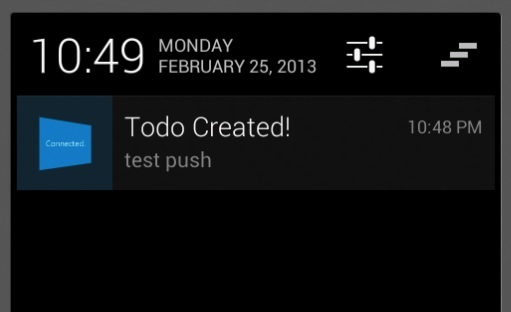 I can create a todo item, it's appearing in my mobo app and in Azure Mobile Services data. But the push notification it's not working. Could you tell me your AVD settings, please? 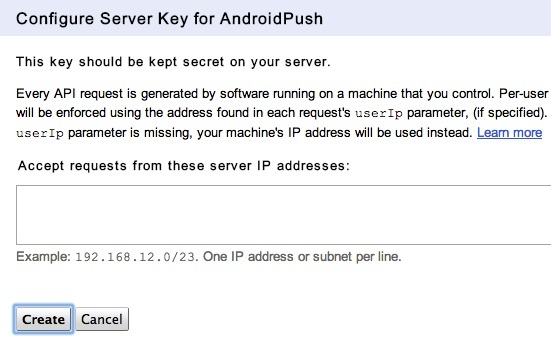 Make sure your AVD is set to use Google APIs, it won't be able to register with GCM otherwise. Other debug steps are to check the Logging tab after attempting to deliver a push (Mobile Services should log if GCM returned any issues). Hi Chris, I searched the web for a reliable push notifications provider and run into urban, parse, pushwoosh, appoxee but the costs are incredible... one of them asking for $500 per month. then I saw this http://www.pushapps.mobi that asking only $20 per month, but I don't know if fair price or not? according to your professional opinion - How much do you think it is fair to pay for that service? what are the steps I should do before choosing the right push notifications service? Have you tried one of them that you recommend? I followed your tutorial step by step. It registers and insert into mobile service well. But I can't receive any notifications. I tried a lot but onMessage never called. Is there any reasons? PS: I downloaded your complete code but it didn't work too. Did you set everything up in the Google Code Console and the Mobile Services portal and put all of the correct keys into your app? Are you getting a registration ID from GCM? Yes, sure about that. I have some devices, some receive notifications, some don't. Hi Chris, i followed the article step by step but never got any Push message, device and everything is getting registered but in logs i get an error "[Error: 400 - The supplied notification payload is invalid. "